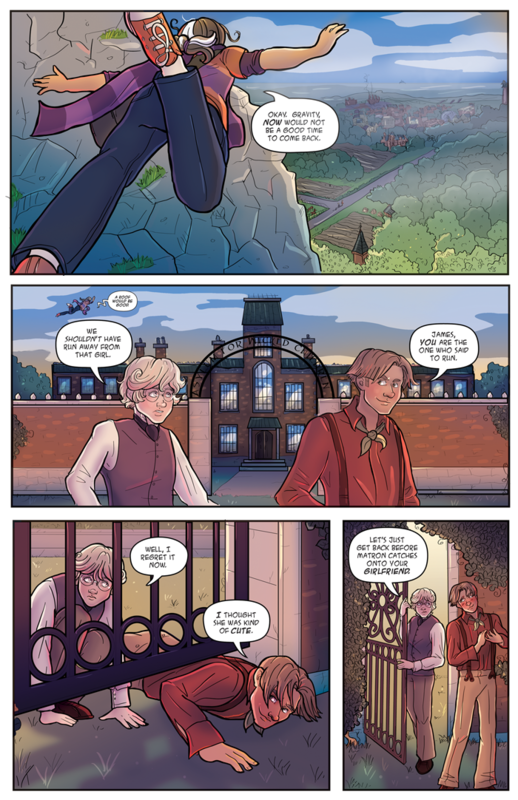 Rory's high in the sky now as the boys return back to the Asylum (yes I changed it-the last version didn't feel right without the high middle and more regular windows, ugh, now I need to make edits on page 19). James is now regretting his cowardly behavior (which isn't shocking given his moral compass). Christian calls him on it though, but dips into Flirty McFlirtsALot mode. James gets a bit of revenge by calling him on that, while demonstrating the proper way to enter through the back gate. Is anyone surprised Kitty is Christian's girlfriend. I mean, she had a good reason for covering for those two yokels.